UPDATE: The “McPick 2 for $5” menu is real and it’s coming to McDonald’s restaurants across the country starting Feb. 29. The Golden Arches confirmed the limited-time meal deal menu in a statement on the company’s website. The company points out that the premium offerings have been offered at discounted prices in the past, but never on the same menu at the same time before. The more expensive meal deal, which includes the option of a Big Mac, Quarter Pounder, Filet-O-Fish, chicken nuggets, and fries, is apparently meant to replace the 2 for $2 deal that was being tested as a replacement for the company’s long-standing Dollar Menu. 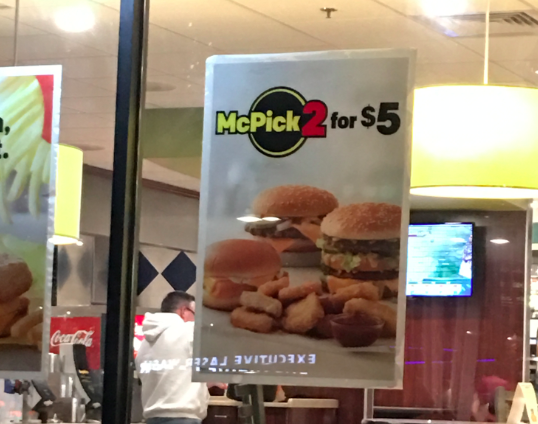 We spotted ads for the McPick 2 for $5 meal deal in both Kansas City, where it appeared on several billboards on major interstates, and Des Moines, where it was plastered on the windows of a restaurant. It’s unclear if the new offer is another meal deal test, or a permanent fixture for the fast food restaurant. Consumerist reached out to McDonald’s on the new promo and we’ll update this post when we hear more. When McDonald’s announced the five-week test of the McPick 2 micro-menu last year it made it clear that it might change the details of the menu after the pilot, but that it planned to stick with the “McPick” concept and name. Benzinga reported last week that the McPick 2 for $5 promo, which has a few variations — some only offering the Filet-O-Fish, while others include all premium sandwiches — would launch at all McDonald’s restaurants by the end of February. Customers and some operators have been promoting, and discussing, the deal on social media for several weeks. While we shouldn’t be surprised by all the menu changing at the Golden Arches, the company continually revamps its menu in hopes of attracting and keeping customers, moving to a more expensive deal might alienate some customers looking for a quick, inexpensive fast food fix. Still, analysts tell Benzinga that the more expensive offer could drive up customers’ tabs and, in turn, franchisee profitability. Additionally, the change to a 2 for $5 promo puts McDonald’s in line with other fast food meal deals: Pizza Hut will sell you items from a set menu for $5 each as long as you buy at least two; Wendy’s is offering a $4 meal where you get a Junior Bacon Cheeseburger, chicken nuggets, fries, and a drink’ Burger King’s 5 for $4 menu includes bacon cheeseburger, small fries, chicken nuggets, beverage, and a chocolate chip cookie; and Hardee’s and Carl’s Jr. have a $4 meal with a double cheeseburger, chicken sandwich, fries, and drink.